You gotta love quick and easy changes that make a big impact. In my ongoing attempt at organization, I have been trying to better plan the weekly menu. This is helpful for two big reasons. First, as a self-proclaimed not-great-chef, it just feels great to know what I am going to make everyday and that the ingredients are actually in my refrigerator. Second, less trips to the grocery store means spending less money…always a good thing. So after planning the menu and having all the ingredients on hand, thought I was on the right track. Silly me would forget to write down the plan (or write it on a post-it or scrap of paper that would get thrown away) and the planning time and effort just went out the window. 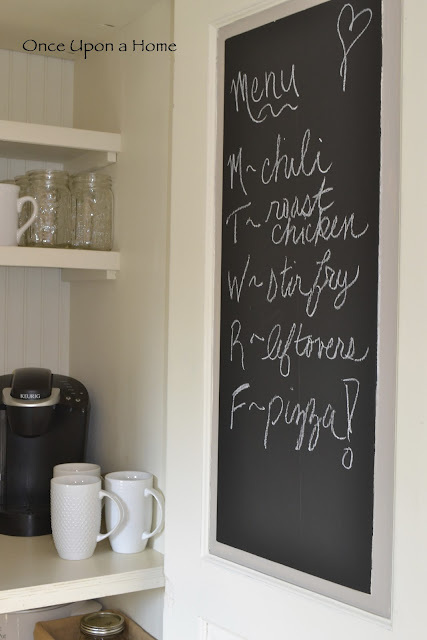 With a little chalkboard paint and extra wall paint from the kitchen (Behr Perfect Taupe), our weeks are suddenly better organized. Since the menu is on the inside of the door, the outside still looks clean and uncluttered when the door is closed. Try this out at home. Can be anywhere…in the pantry or behind a cabinet door. Chalkboard paint dries unbelievably fast, so you can be done in about an hour…even with three coats of paint! 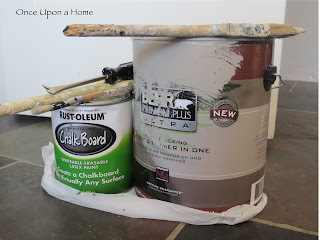 A quart of chalkboard paint goes a long way, so maybe share with a friend. UPDATE: Thanks so much to Kelly from LilyPadCottage for her inspiring chalkboards designs. 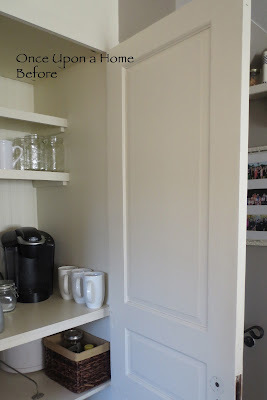 This entry was posted in In the Kitchen and tagged chalkboard menu, kitchen organization, pantry organization on February 17, 2013 by onceuponatimecreation.